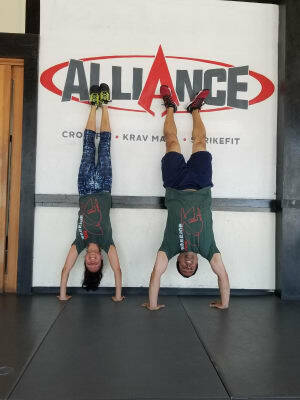 CrossFit handstands from our most recent Warrior 100 members doing hand stands at Alliance Culver City! We give out Warrior 100 shirts to members who take 100 classes during the calendar year. Athletes must take cross train in Krav Maga, CrossFit, and StrikeFit. Nancy and Az are our most recent recipients. Nice work!